HONG KONG, Apr 27, 2018 - (ACN Newswire) - The HKTDC and the Belt and Road Pioneer are jointly organising the "Belt and Road Journey" Youth Exchange Programme to encourage the city's young people to participate in the development of China's Belt and Road Initiative. The trip will take about 20 Hong Kong youths, aged between 18 and 25, on a trip to Xinjiang and Kazakhstan, in Central Asia, in late July. The trip will include visits to local businesses and cultural exchanges with local citizens and youth, enabling the participants to gain an understanding of the economies as well as experience life in countries along the Belt and Road route. The programme is now open for application. Co-organised by the SMEs & Younger Generation Working Group under the HKTDC Belt and Road Committee and the non-profit Belt and Road Pioneer, the "Belt and Road Journey" Youth Exchange Programme is supported by tertiary institutions in Hong Kong. Raymond Yip, HKTDC Executive Director, said, "The HKTDC actively promotes a series of activities which we hope can enable more people to understand the Belt and Road Initiative, as well as strengthen Hong Kong's role as the commercial hub for the Initiative. Jason Chiu, Convenor of the SMEs & Younger Generation Working Group and Founder & CEO of Cherrypicks, said: "Central Asia is relatively 'foreign' to many young people in Hong Kong, yet it serves as a critical hub connecting China, Russia and the Middle East. The Youth Exchange Programme is the Working Group's predominant event this summer. "Through a creative and fun approach, the Programme aims to raise local youth's awareness of the countries along the Belt and Road Initiative, help them better understand the opportunities arising from the Initiative, as well as encouraging them to proactively participate in Belt and Road developments in the future." Wilson Chan, Chairman of Belt and Road Pioneer, said that Belt and Road opportunities are not limited to the business, but also other aspects of life, such as cultural exchanges. "Through this programme, we seek to encourage young people to actively equip themselves, expand their horizons and develop more interests by exploring opportunities around the world." Participants will travel to a number of Central Asia cities along the China-Kazakhstan Railway including Urumqi, Yining, Khorgas and Almaty. Highlights of the programme include exchange activities with local tertiary students, as well as visits to major companies, logistics and industrial parks, and landmarks such as the Urumqi international Bazaar and the Huiyuan Ancient City. To help all young people in understanding Belt and Road opportunities, arrangements will be made for participants to share their experiences on the journey on television, social media and through other channels. 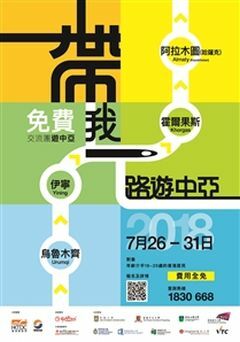 The programme is open to Hong Kong residents aged between 18 and 25, who can apply by uploading to a dedicated website a 40-second video with self-introduction and presentation of their understanding of the Belt and Road Initiative. For enrolment details, please refer to http://beltandroadjourney.hktdc.com/en/. The HKTDC announced the formation of the HKTDC Belt and Road Committee in December last year. Through its five working groups targeting different markets and business sectors, the Committee implements a comprehensive and targeted programme to engage different sectors and the public to participate in Belt and Road development and share in the benefits presented by the Initiative. In particular, the SMEs & Younger Generation Working Group seeks to promote and foster participation of young professionals in the Initiative, as well as to help start-ups and small and medium-sized enterprises (SMEs) expand their business into Belt and Road markets. The Belt and Road Pioneer is a voluntary organisation that aims to introduce the Belt and Road Initiative to youth.